Showing 1 - 1 of 1 Products for Air Horn Compressor Kit. The Veloci-Raptor Onboard Air Systems feature the heavy duty 6350RC 100% duty cycle air compressor and 1.5 gallon US Made air tank. Both mount to a vehicle-specific bracket bolted to factory locations on your Ford truck. Works with aftermarket powered side steps. 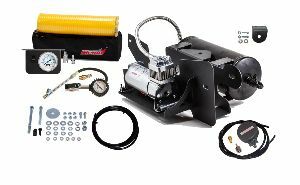 System also includes a quick connect tire inflator with gauge and storage bag.